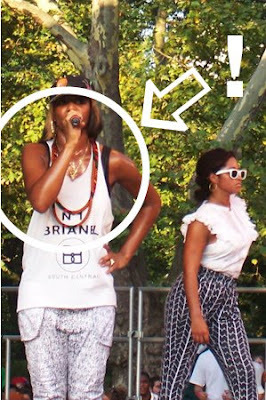 eagle-eyed stevie emailed me today that miss SANTOGOLD was wearing an amaaaazinggggg ANGELA BARROW necklace when she played summerstage last weekend!!!!!! i have blogged about the SICKNESS that is my friend ange's jewelry...and in just about every photo that i take in my bedroom mirror, you can see some of her cotton necklaces on the doorknob. i also begged her last fall for thin black chokers- which she made me, and i love. santoG is wearing one of her cotton african print ones, it looks so goood! TOTALLY AMAZING. WE LOVE YOU, ANGELA!